In the first books in the series of The 10,000 Adventures of Minnesota Dan, we were introduced to Dans deep and abiding faith in God. When uncontrollable events prove fearful and scary to him, he prays to God for help and his prayers are answered. His faith is tested mightily: during a perilous canoe ride with Rusty, his golden retriever; followed by a voyage sailing through a frightening rainstor… m; having a crushed bike wheel which threatens to end a long trip; and lastly, having a mystical experience while cross-country skiing in the Hiawatha Valley. In this sixth book, How I Speak to God: Teaching Children How to Pray, Dan explores a simple way, through prayer, how to communicate on a personal level with God, The Creator. In memory of Barbara LeBuhn,keeping her close in our hearts. 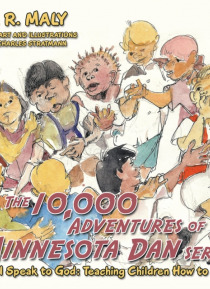 Timothy Maly and Malik MalyWith sincere appreciation of your kind support forThe 10,000 Adventures of Minnesota Dan seriesof childrens books.